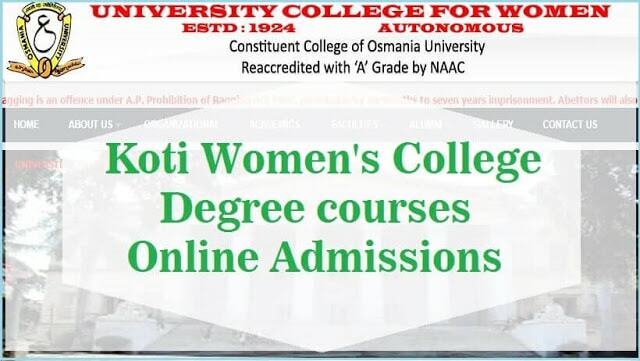 Koti Womens College Online Degree Admissions 2018 Notification/ OUCW BA, BCom, BSc Online Degree Admissions 2018/ OUCWKOTI UG Admissions 2018 : Osmania University College for Women, Hyderabad is going to release the Degree Admission 2017 notification in March month and the Koti OU women college would invite the online applications from the eligible women students for admission into its BA, B.Com., B.Sc. Programs for the academic year 2018-2019. Candidates must have passed the Intermediate Examination conducted by the Board of Intermediate Education of Telangana (BIE Telangana)/BIE AP or any equivalent qualification by recognized board. Eligible Candidates should submit the Online application form at DOST Web Portal with required documents. DOST News: The schedule of online registrations starts in May, 2017. Instructions to the students, colleges can be seen under latest news. Colleges can access their College and course wise seat allotments from ccets.cgg.gov.in. Last Date with late fee is 17.06.2016.